I’m remodeling my newly purchased 1954 home, and trying to keep as much original as possible. We have a fabulous shower stall (pink and mint green tile!! LOVE IT! ), but the pipes are no longer healthy. We are having to have the entire house repiped. What I am looking for, is a 6 inch shower fixture “body,” the pipe that separates the hot and cold knobs. My plumber says that the standard is now 8 inch, and that it is impossible to find a 6 inch fixture. He wants to tear out the entire stall, which I am adamantly against. I’m hoping you might have a lead for these 6 inch pipe fixtures? I ended up emailing Locke, and they had THE PERFECT part!!! Price Pfister stopped making the last true 6″ center kitchen faucet about 15 years ago, as far as we know. 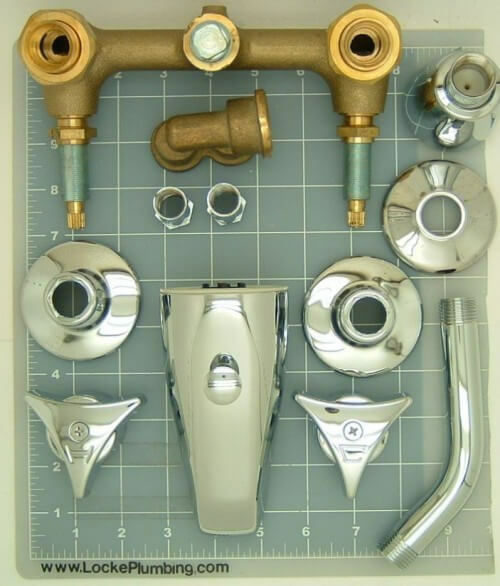 Some of the import single control (Delta clone) faucets had adjustable centers on them, either 6″ or 8″, but the deck plate wound up being too long for some applications. Nothing for the 6″ center tub showers, we rarely get asked. So the answer to this one: GO TO LOCKE PLUMBING! I’ve written about Locke Plumbing before — in our Bathrooms / Faucets category, where you can find lots of info about resources to replace or repair your bathroom faucets. Cleaning the bathtub slip resistant bottom: OMG, it’s like new!